Once again Facebook are under scrutiny for bad protection efforts. The Tech Giants latest screw-up was a programming bug that gave 1,500 third-party apps access to the unposted Facebook photos of as many as 6.8 Million users. This comes at the back of Google saying they will be shutting down Google+ 4 months earlier after another data breach. 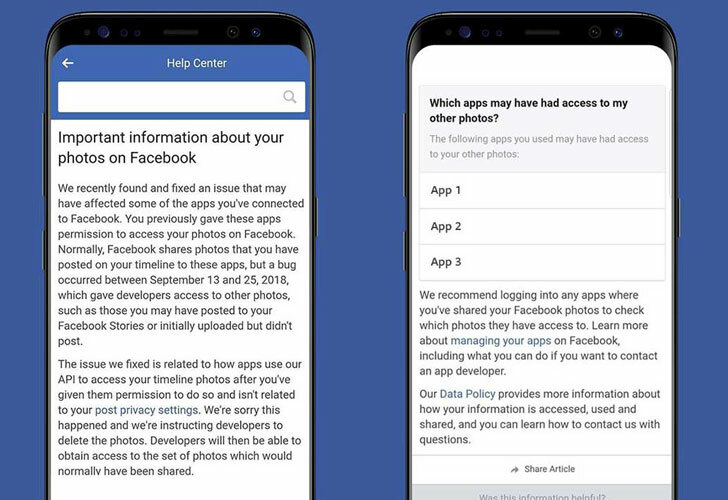 Facebook quietly, via its developer’s blog, announced over the weekend that they have discovered a new API bug in its photo-sharing platform that let 876 developers access users’ private photos. The worst part is that if you went to post a photo and decided not to… your photo was still stored and accessed by 3rd party businesses including photos on Facebook market place and facebook stories. The private data of the millions that were breached was exposed and available for 12 days, between September 13th and September 25th, until Facebook’s security team detected the vulnerability and fix the issue. Facebook started notifying impacted users of the flaw through an interesting alert on affected users timeline in which directs them to the Help Centre page that has further information on the breach. It’s no secret that 2018 has been a rough year for Facebook, first, the Cambridge Analytica scandal, then we reported the 30 Million Facebook accounts that were hacked, then when we thought it was all over we posted on how Facebook allowed for another vulnerability within its platform. Please stay safe, if you’re a business that has a BYOD device model please read this.